The casing shoe bits (rod shoes bits) are designed to drill in casings or rods in difficult over burden material to position the rods or casing in the drilling hole. The interior is smooth and sufficiently large enough to allow free passage of coring equipment such as bits, reaming shells core barrels and drill rods. They are manufactured to withstand difficult drilling conditions: for example, unconsolidated overburdened or broken abrasive materials. Impregnated casing shoe bits are recommended for very hard and fractured formations. They can be manufactured in all series and varying impregnation heights to suit your individual requirements. 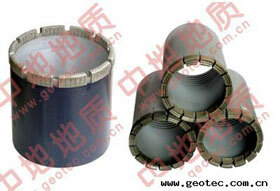 Geotec's surface-set casing shoe bits are manufactured with high quality natural diamonds These tools are used in various overburdens formations. We are a professional casing shoe bits (rod shoes bits) manufacturer and supplier in China, making impregnated casing shoe bits, surface-set casing shoes bits etc. We have gained the recognition of a large number of clients through our 20 years' production experience and marketing and serving experience, and meanwhile we have accumulated abundant experience in terms of products. At the same time, we keep researching casing shoe bits (rod shoes bits) that can better meet the clients' needs and the market. Our casing shoe bits (rod shoes bits), like impregnated casing shoes bits, surface-set casing shoes bits have been exported to South America, Africa, East Europe, Southeast Asia, and Middle East. We have clients in America, United Kingdom, France, Canada, Australia, New Zealand, Philippines, Indonesia, India, Chile, Brazil, Russia, Algeria, Morocco, Malaysia, Thailand, Pakistan, Mongolia etc. Located in Wuxi, near Shanghai, the biggest port city of China, we are provided with convenient transportations of any kind, by land, sea or air, which will greatly reduce your transportation cost. To meet the clients' different demands, we can provide all kinds of geological drilling tools, such as impregnated diamond bits, diamond core bits (synthetic natural), reaming shells, PDC bits, core barrels, drill rods. If you need them, please contact us.